A total of 22 teams will take part in the Down Feile Footall Finals this coming Easter Monday. Registration is at 10.00am with the first set of group games starting at 10.20am. Down have 4 teams qualifying for the National Feile Finals this year which takes place on the 28th June – 30th June in Connacht. 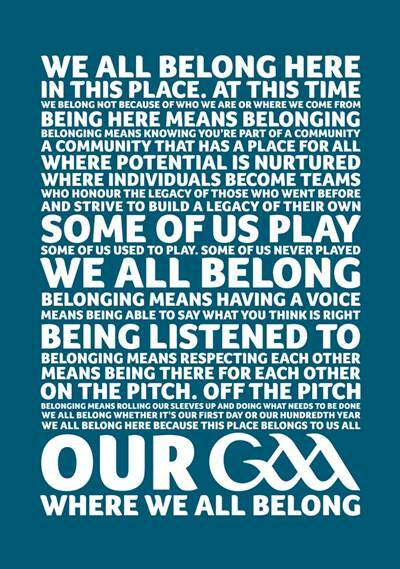 All clubs will receive the new manifesto which is centered around the statement: ‘GAA – Where We All Belong’ / CLG – Tá Áit Duinn Uilig Ann’ and the intention is for it to be proudly displayed across the GAA network and wherever Gaelic Games are played. Clubs are encouraged to install the manifesto on their own premises and use it as a living reminder of our ideals as we head towards our 135th anniversary in November. St Colmcille’s was today the chosen location for the unveiling of this manifesto – in both Irish and English. The Meath club has been lauded for its contribution to its community and its stellar activity in the Bettystown area – much of it away from the field of play. The club embodies the role and importance of the thousands of players, coaches, administrators, members, supporters and volunteers who each play their part in making the wider Association the vibrant celebration of sport and culture that it is. The manifesto unveiling marks the start of a wider support message that celebrates belonging to the GAA. This initiative follows in-depth research conducted over the past 12 months among 8,000 people into what the GAA really means to them in modern day Irish life. This research revealed that the sense of belonging the GAA gives to people is of utmost importance to them. GAA President John Horan said: “Following an engagement process with our members and supporters we are pleased to unveil our new GAA Manifesto which serves as a reminder that we all belong to the same special organsiation. “Today’s event and the actions that will follow aims to position our Association, and those who make it all that it is, at the centre of our efforts to promote the GAA. GAA Director General Tom Ryan added: “Today serves of a reminder that we all come from clubs and that there is a place for us all in the GAA. “Next week, you’ll also see this brought to life in a campaign that celebrates belonging. It features GAA people and the cut and thrust of GAA life across our GAA digital and social networks, as well as on TV, radio and in print.